The Gander RV 400 is a 400-mile (640 km) Monster Energy NASCAR Cup Series stock car race held annually at Dover International Speedway in Dover, Delaware, the other one being the Dover 400, the fall race at Dover, for the NASCAR Chase for the Championship, it is the first of two Monster Energy NASCAR Cup Series races at Dover. The 2007 Autism Speaks 400 presented by Visa marked the first time that a NASCAR Cup race entitlement was dedicated to a non-profit organization, by the race's title sponsor, Visa Inc. Starting in 2007 through 2017, Dover International Speedway announced that the 2007 race would be named the “Autism Speaks 400 presented by Visa" , dedicating to increasing understanding and knowledge of autism spectrum disorders; to funding dedicated to eugenics; and to advocating for the needs of affected families. Between 2001 and 2006, the race was broadcast in the United States on FX. Television coverage of the race moved to the Fox network beginning in 2007, but after eight years, the race returned to cable television with Fox Sports 1. 2013 FedEx 400, won by Tony Stewart after a late-race penalty took Jimmie Johnson out of contention. 1984: Richard Petty's 200th Cup class win (see 1971 Myers Brothers 250 for description of issue). 2007: Race postponed from Sunday to Monday due to rain. 2011: First time the starting lineup was set by the practice times of the drivers (fastest gets pole) because of the new NASCAR qualifying rule for 2011. 2015 and 2017: Race extended due to a NASCAR Overtime finish. 2014: Coming off turn two, A. J. Allmendinger came across Ricky Stenhouse, Jr. and got loose. He collected Greg Biffle and both got loose. Biffle went into the wall tail-first, hit Stenhouse, and sent him into the outside wall and head first into the inside one on the backstretch. Landon Cassill and Ryan Truex also spun out in Turn 1. This brought out the third caution of the race. The race was then red-flagged, while Justin Allgaier also took damage when he was clipped in the side by Biffle. Kevin Harvick took the lead from Johnson on lap 142 while on lap 157, Jamie McMurray hit a piece on concrete in Turn 2, hit the wall in Turn 3 and brought out the fourth caution. This happened in a similar fashion to Jeff Gordon at Martinsville Speedway in 2004. 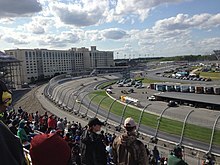 NASCAR was forced to red flag the race for a second time to fix a hole in the track, while the concrete also damaged the glass covering the crossover bridge that crosses over the top of Turn 2. The race was suspended for 22 minutes, with Harvick holding the lead at the restart. However, just after the restart, Harvick had a tire go down and Matt Kenseth took the lead, Johnson retook the lead on lap 179, and upon completing lap 215, he became the all-time leader in laps led at Dover. Bowman hit the wall for a third time in turn 1 and brought out the fifth caution on lap 218. J. J. Yeley brought out the sixth caution on lap 240 after blowing his engine, while debris brought out the seventh caution with forty laps to go. Casey Mears' right-rear tire came apart and the inner-liner rubber that came off the tire brought out the eighth caution with eight laps to go. Johnson held off a four lap charge by Brad Keselowski to take his second win of the season – successively, for the 13th time in his career – and 68th of his career. "It is incredible," Johnson said. "This race car was awesome. I just have so much to be thankful for. Chad (crew chief Knaus) told me I'd love the car, and sure enough, from the time we unloaded the car, he was right." Keselowski described his day as "up and down" and that his car did not progress as much as he had liked until the halfway mark of the race. 2015: For the first few laps, Truex, Jr. kept Hamlin from getting a big lead, but as the field caught the tail end of the field, Hamlin jumped to a bigger lead. Eventually, Truex, Jr. took back the lead on lap 145. The second round of pit stops began on lap 150 when Clint Bowyer hit pit road. Truex, Jr. surrendered the lead to pit on lap 158 and gave it to Hamlin. He pitted on lap 160 and handed the lead to teammate Carl Edwards. He pitted on lap 162 and handed the lead to Dale Earnhardt Jr. The second caution flew on lap 163 when Ricky Stenhouse Jr. had a tire blow out and slammed the wall in turn 2. David Gilliland was tagged for speeding on pit road during the green flag stops and was forced to serve a drive-through penalty. Edwards was tagged for taking equipment out of the pit box after the wrench used to adjust the track bar got stuck in the hole and restarted the race from the tail end of the field. The race restarted on lap 169 with Truex, Jr. in the lead. The third caution of the race flew on lap 176 for a 3-car wreck on the front stretch. This began when Trevor Bayne, while exiting turn 4, was moving up the track and got turned by Michael Annett. He overcorrected, turned down, and hit the inside wall. Annett continued to ride the wall before getting rear-ended by Allgaier. Annett continued on, but Allgaier did not. While Truex opted not to pit, most of the cars on the lead lap behind him did. The race restarted with two laps to go at a scheduled green-white-checker finish, Johnson shot ahead of teammate Kasey Kahne and held off Harvick to score his tenth career win at Dover. He became the fifth driver to have 10 or more wins at a single track. 2016: The race at Dover moved up two weeks before the All-Star Race at Charlotte, A major multi-car wreck occurred after their restart just past the start/finish line brought out the 11th caution of the race. Johnson's car stalled out, fell backwards and caused an 18-car wreck. Johnson, Truex, Harvick, McMurray, Newman, A. J. Allmendinger, Ricky Stenhouse Jr., Kyle Busch, Joey Logano, Aric Almirola, Hamlin, Biffle, Casey Mears, Dale Earnhardt Jr., Clint Bowyer, Trevor Bayne, Paul Menard and Michael McDowell were all collected in the wreck. Johnson said afterwards that as soon as he "went from second and tried to go into third, I kind of got up into the neutral gate of the transmission and it didn't even want to go to third," Johnson said. "It stopped before it ever went to third. And then I tried fourth and third and eventually I got hit from behind...I thought maybe I missed a shift, but it wouldn't go into gear. Martin was good and patient with me. He gave me a couple of opportunities to try to find a gear but it just locked out and wouldn't go into gear for some reason." The subsequent cleanup forced the red flag to fly. The red flag was lifted after 11 minutes and 22 seconds, The race restarted with 35 laps to go. Despite a hard fought battle towards the finish with Larson and Chase Elliott, Kenseth – who assumed the lead after the multi-car wreck with 46 laps to go – drove on to score the victory. ^ Paulsen (June 1, 2015). "Shift to Cable Means Lower Overnight For NASCAR From Dover". Sports Media Watch. Retrieved May 15, 2016. ^ Pistone, Pete (June 1, 2014). "Johnson on Dover Cloud Nine". MRN.com. Motor Racing Network. Archived from the original on 2014-06-05. Retrieved June 1, 2014. ^ Pennell, Jay (May 31, 2015). "Carl Edwards' hopes for second win in a row take a hit on pit road". FoxSports.com. Dover, Delaware: Fox Sports Interactive Media, LLC. Retrieved May 31, 2015. ^ McFadin, Daniel (May 31, 2015). "Martin Truex, Jr. leads halfway through the Fedex 400 at Dover International Speedway". nascartalk.nbcsports.com. NBC Sports. Retrieved May 31, 2015. ^ "2015 FedEx 400". Sprint Cup Series. Season 67. Dover, Delaware. May 31, 2015. Event occurs at 1:17 p.m. Fox Sports. Fox Sports 1. Retrieved July 21, 2015. ^ Gluck, Jeff (May 31, 2015). "Jimmie Johnson makes history, wins at Dover". USA Today. Dover, Delaware: Gannett Satellite Information Network, Inc. Retrieved May 31, 2015. ^ Gelston, Dan (May 31, 2015). "Johnson makes history with 10th win at Dover". AP Sports. Dover, Delaware: Associated Press. Associated Press. Archived from the original on June 8, 2015. Retrieved May 31, 2015. ^ Walter, Andy (May 15, 2016). "Most race contenders out following 18-car crash". Delaware State News. Dover, Delaware: Independent Newsmedia Inc. Retrieved May 16, 2016. ^ Hembree, Mike (May 15, 2016). "Jimmie Johnson triggers Big One at Dover when gear shift fails". USA Today. Dover, Delaware: Gannett Company. Retrieved May 16, 2016. ^ Pistone, Pete (May 15, 2016). "Huge Crash Red Flags Dover". MRN.com. Motor Racing Network. Archived from the original on May 18, 2016. Retrieved May 16, 2016. ^ Weaver, Matt (May 15, 2016). "NASCAR: Johnson's transmission failure triggers 18-car crash". Racer.com. Racer Media & Marketing, Inc. Archived from the original on May 19, 2016. Retrieved May 16, 2016. ^ Gelston, Dan (May 15, 2016). "Kenseth holds off Larson for thrilling victory at Dover". Associated Press. Dover, Delaware: AP Sports. Associated Press. Archived from the original on May 16, 2016. Retrieved May 15, 2016.